From the same people who brought you the Evangelion iPhone Battery Case, here comes another gadget that’s sure to get fans char…. —sorry, actually it would be just too corny to say that; let me start over. Studio Khara have again teamed up with X-Pal Power(Energizer) to offer Evangelion themed versions of the XP1000 portable battery charger pack. Unlike the previous offering, which was only of use to iPhone owners, the XP1000 packs operate over USB and can be used to give extra charge to all kinds of devices. The examples given include mobile phones, PSPs and the Nintendo DS. The pack comes in two themes: Model I has a Rebuild style Nerv Hexagon theme; and Model II has Rei, naturally. 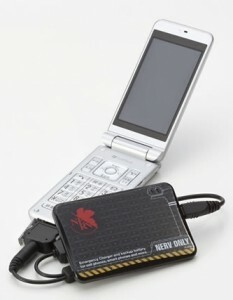 Energizer information page about the XP1000 power pack—Has images and example video. Apparently, the site is already taking preorders and the cases themselves will be available on the 15th of May. The packs are retailing for around 6000 Yen (~$65/€48) on the EvaStore.